A quick three days at Martha Street Studio finished up with the opening for our exhibition, All the Stories We’re Not Telling About Winnipeg. The show features a series of posters made by participants from our workshops and created in response to the stories they collectively wrote. 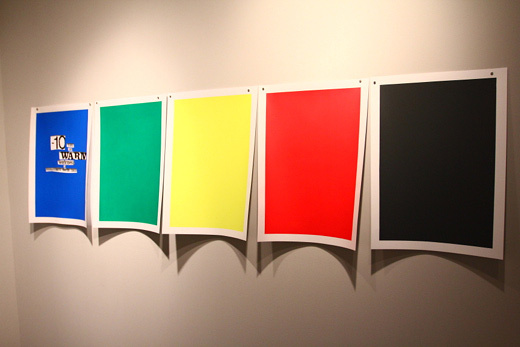 The exhibition runs until January 5, 2012! We have to extend an incredibly huge thank you to everyone at Martha Street Studio for facilitating this residency and exhibition. We were floored by the support we received there and were lucky enough to host some exceptionally great Winnipegers at our workshops. Needless to say, we had a great time — and below is how it all came together. After a full night’s rest and a wholesome breakfast at The Tallest Poppy, we headed back to Martha Street Studio to formulate a game plan for our second work session and workshop later that evening. Knowing that we had an inordinate amount of work to do before our opening, we decided to spend the bulk of the day getting the visual material (posters) completed and ready to hang. Our workshop participants from Monday night left us with a very good chronological story and a number of great Letraset statements on paper. 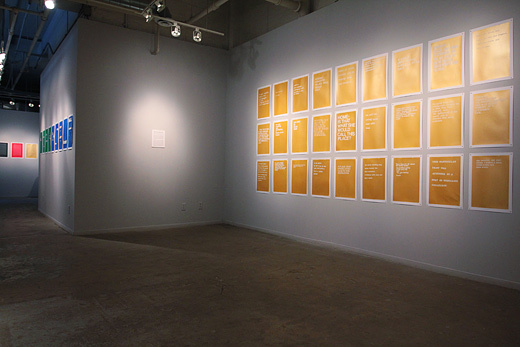 Our intention is to combine the posters and text from both sessions into a body of work. We also had pockets of time to consider our exhibition layout and what we should include. Pictured above is a rough layout of the workshop poster series colour options, each of which may or may not denote an emotion or theme. Arriving in Winnipeg late Sunday night, we were met with our first taste of winter for the year. It seemed like the right introduction to Winnipeg. This residency and exhibition is all about exploring the narratives that are (and are not) circulated about the city of Winnipeg, and perhaps any story of Winnipeg should indeed begin with the winter. Suzie from Martha Street Studio picked us up at the airport and gave us a quick driving tour before we settled in at MAWA‘s apartment. Monday morning, we headed in to Martha Street Studio and got started right away sorting through the materials and work spaces available to us. Among many things, we also got (re)acquainted with silk screening, which is now officially one of our favourite things to do. Next week, Justin, Michelle and Josh will be stationed at Martha Street Studio in Winnipeg to do a quick residency involving workshops, walks, and a lot of on-the-ground research leading up to an exhibition. In Winnipeg? Check out the Martha Street Studio facebook page for more event information! Martha Street Studio houses an exhibition gallery open to the public 5 days a week from 10–5pm. Martha Street Studio also has an inventory of artists’ work for sale and an archive of work produced at the studio since 1988. We know a city from the stories we tell about the city. But, we can also know something about a city from the stories we don’t tell about it. Winnipeg is no different. Some of these stories we tell are about celebrating everything the community has to offer, while others are about all of the things that make the city a difficult place to love. However, there are still other stories that fall somewhere between the two, based on the personal narratives we all chart as we live, work, play, and move throughout the city. These stories of our everyday experiences are the ones that we don’t hear enough about. 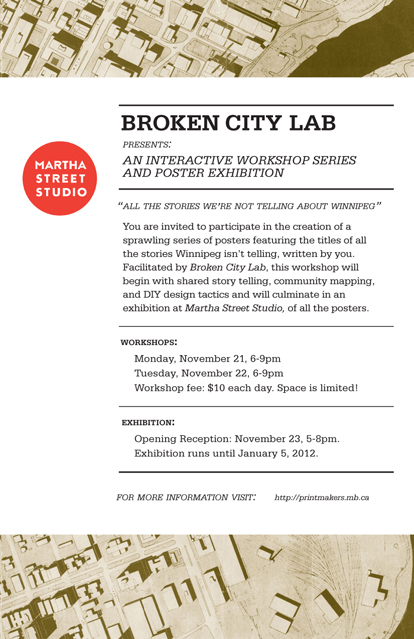 You are invited to participate in the creation of a sprawling series of posters featuring the titles of all the stories Winnipeg isn’t telling, written by you. 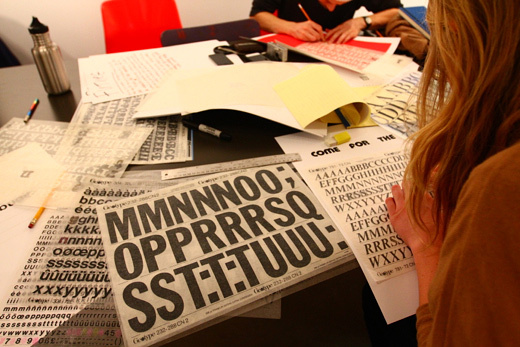 Facilitated by Broken City Lab, this workshop will begin with shared story telling, community mapping, and DIY design tactics and culminate in an exhibition at Martha Street Studio, of all the posters. And, we’ll definitely be trying to blog as much as we can about the trip! More soon.